It was another brutal week for equities and the end to a brutal month. The ASX 200 lost ~6% this month, wiping out its yearly gains and then some. It’s down around 4% for the year now. If you had some Bitcoin allocation in your portfolio you would have fared a little better this month with XBT only down 3%. Global Bitcoin volumes remain at 1year lows and the 30day realised volatility is down to early 2017 levels, where it was before the historic rally that drew many of us into this space. More on that later. It’s been reported that Bitcoin is now deemed property from a legal standpoint and that it is legal to circulate and use Bitcoin as a form of payment in China. Given the track record of Chinese policy makers changing their mind all the time I can’t see too many merchants rushing to accept bitcoin as a payment method but it’s certainly a step in the right direction in my opinion. Bitstamp, the largest digital currency exchange in the EU by volume, was bought by Belgium based investment company NXMH. Deal details are scarce however it is estimated that the deal was worth around AU$600 million. Not bad for a company that started out of a Slovenian garage by two blokes, a server and some laptops. Coinbase has listed rival exchange Circle’s USDC stable coin. The interesting thing about USDC is that it has an actively managed “global blacklist” which allows Circle’s CENTER to monitor IP addresses and intercept transactions deemed an AML threat. Decentralisation maximalists already hate this, but regulators will likely demand it. Through numerous acquisitions Coinbase has the foundations to offer almost a full suite of banking facilities. Including, stable value deposits, institutional custody, licenses for security issuance, financial advisory and infrastructure for merchant adoption. A current popular point of conversation is how low Bitcoin volatility is getting and what it means. In the chart above we have comparisons for the ASX 200 (blue), S&P500(white) and XBT/USD (orange) 30 day realised vol annualised at a percentage. What’s important to note is the divergence we have seen in this month between XBT and equity vols. This is important for two reasons. Firstly, it shows that Bitcoin price action was unaffected by this month’s equity meltdown, if anything Bitcoin prices remained more stable. 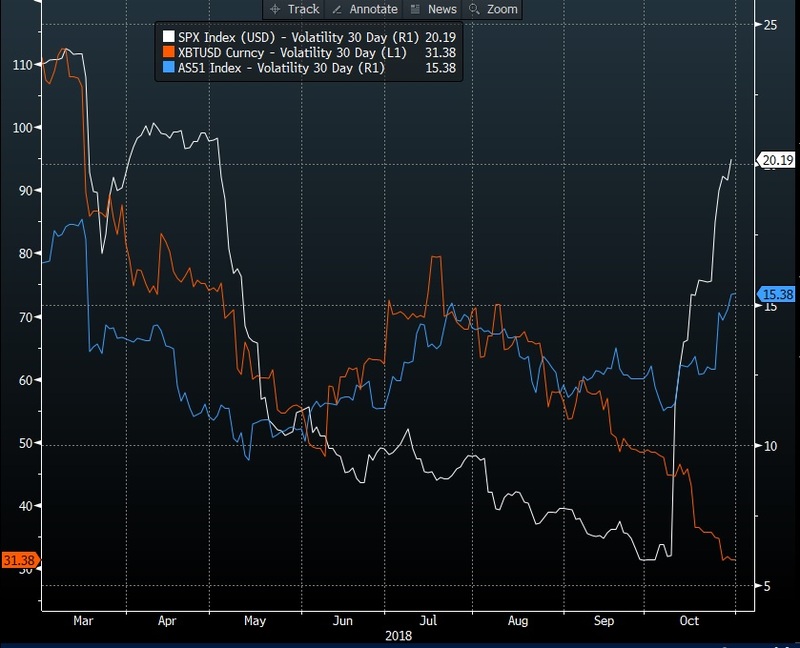 Secondly, with XBTUSD 30day vol at 31.38 it’s getting closer to US equity vol of 20.19. It would be crazy if we saw a flippening where, from a vol standpoint, US equities became a more risky investment than Bitcoin.